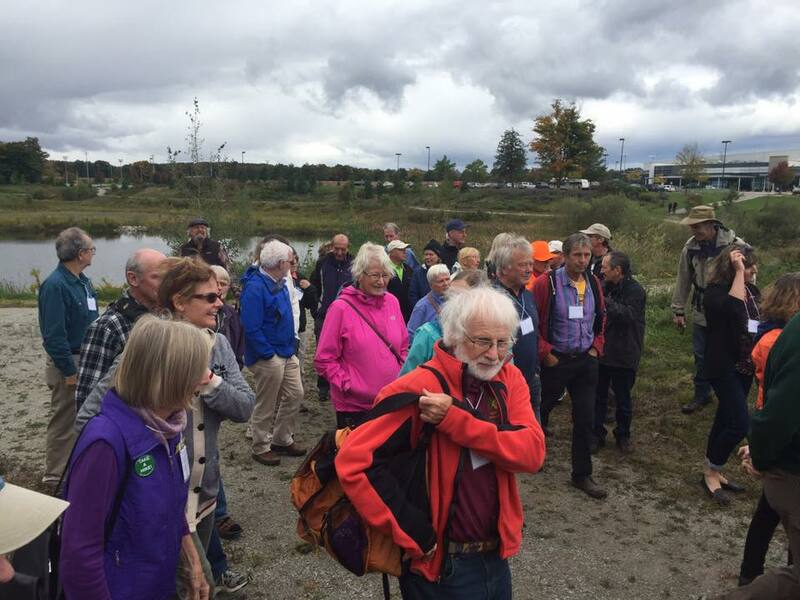 Today is the long-awaited 50th anniversary of the Ganaraska Trail, which was founded in 1968. I would like to welcome you all to celebrate this special day with us. I know some of you have come from far away, as far as Ottawa, Perth, London, Newcastle, Goderich and anything in between. I also welcome our Ganaraska members from our own 9 clubs: Pine Ridge, Kawartha, Wilderness, Orillia, Oro Medonte, Barrie, Mad River, Wasaga Beach, Tiny and Midland! 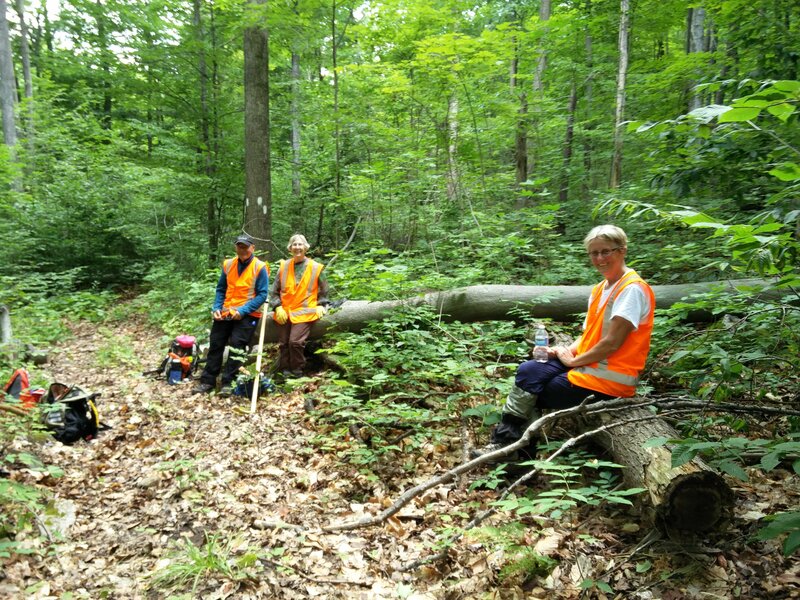 Our membership currently stands at 594 and our volunteers maintain close to 600 kms of trail, including through the Queen Elizabeth II Wildlands (to the north east of Orillia), which is an extremely remote but very unique area, as it is entirely on the rugged Canadian shield. 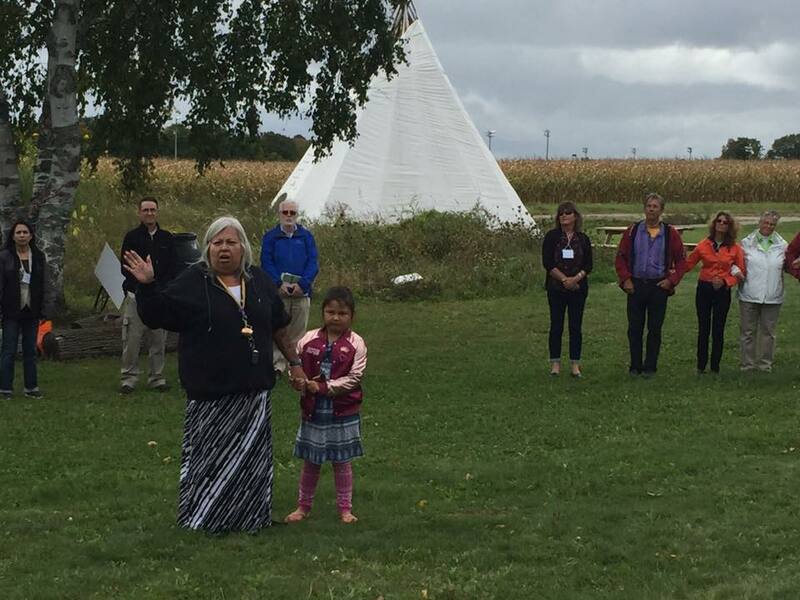 To start our celebrations, I would like to acknowledge the privilege we have to be gathered here today on the traditional land of the Anishinaabeg, the Indigenous peoples of this region. We also acknowledge the history that many nations hold in this area and look forward to doing our part in forming respectful relations with First Nations, Metis, and Inuit. 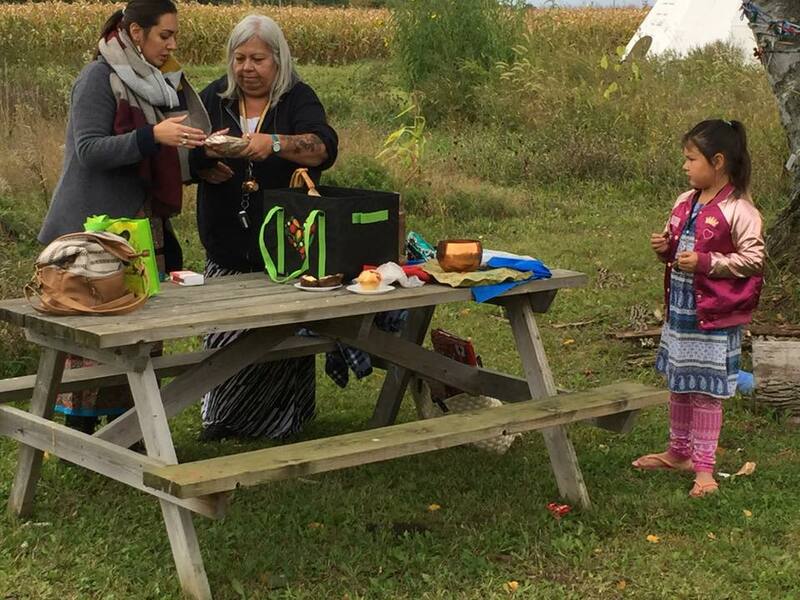 In a few hours, we will conduct an indigenous Water Ceremony, with waters from Lake Ontario and from Georgian Bay, which were in the past few months carried by hikers along the entire Ganaraska Trail. These water bottles will arrive from the eastern and western parts of the Ganaraska Trail through Scout Valley and will arrive at Lakehead University later this morning. Please join us for the last part of this Water Relay hike. This 50th anniversary celebration year has so far been a year of many achievements. The hiking season started with our own clubs having an official Season Opener on April 21. The weather, however, caught us off guard, with a serious snow dump just prior to the event, which caused our hike leaders to decide whether to snowshoe or hike. Luckily, the sun came out for the day, and blue skies made sure all had a wonderful time. Shortly after, the water relay started. Bottles were dipped in Lake Ontario and Georgian Bay, and carried by hikers along the entire Ganaraska Trail. Since most of our clubs also have a cycling program, the water bottles were also transported by cyclists along some of the road sections. And as mentioned the water is arriving here today. I would like to congratulate all those who in the past, and especially this year, hiked the entire trail. E2E records have been kept since 1992. Only 179 hikers have completed the GHT since then. Of interest, a few did it multiple times, such as Peter Verbeek hiked it 8 times by 2003, Rose Millett 3, Ron Wallace 2, Michelle Vibert 2, and Tom Hall 2. 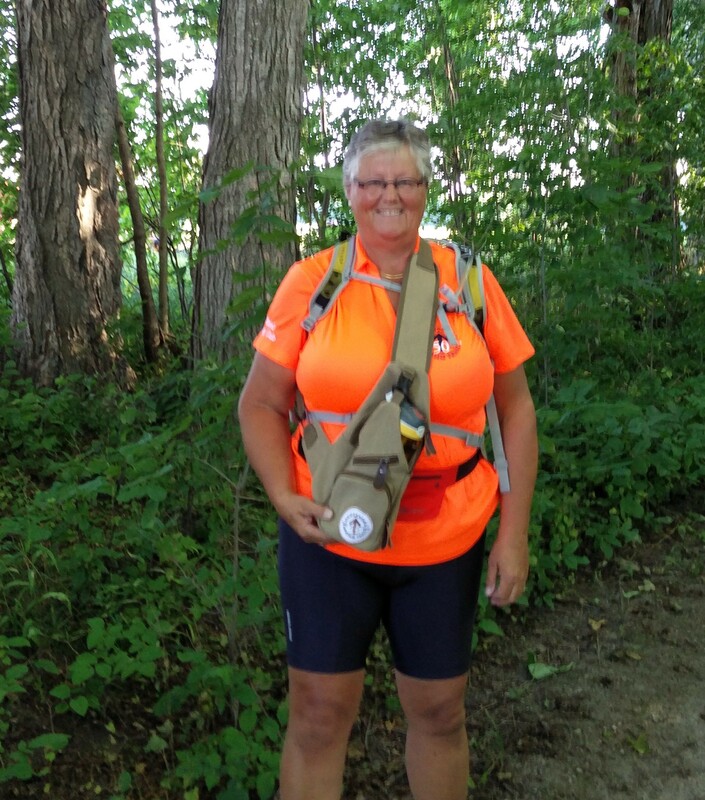 Another ex exceptional event that took place along the Ganaraska Trail this summer is the Fastest Known Time even. A Toronto relay team of 11 young women, called the Wild Bruce Chasers, picked July 1, probably the hottest day of the summer, to hike the entire Ganaraska Trail in an impressive 69 hours. 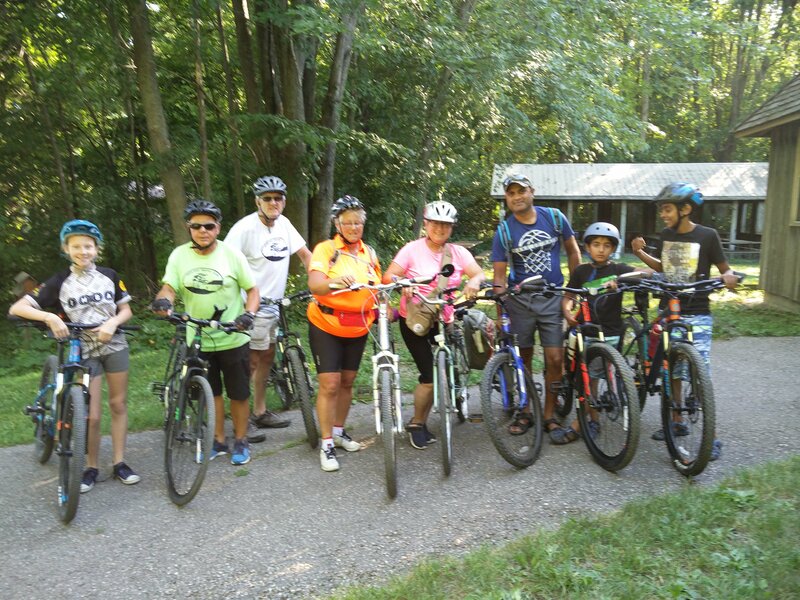 What an achievement, especially since the Ganaraska Trail Standards are “minimal impact to the environment”, and as such the ladies faced brambles, poison ivy, persisted deer flies, etc., but if you can believe it, they actually enjoyed their gruelling challenge. Well done Wild Bruce Chasers! If you wish to experience our Ganaraska Hiking Trail yourselves, I hope you will join us tomorrow in the beautiful Copeland Forest, where we have organized a number of hikes. 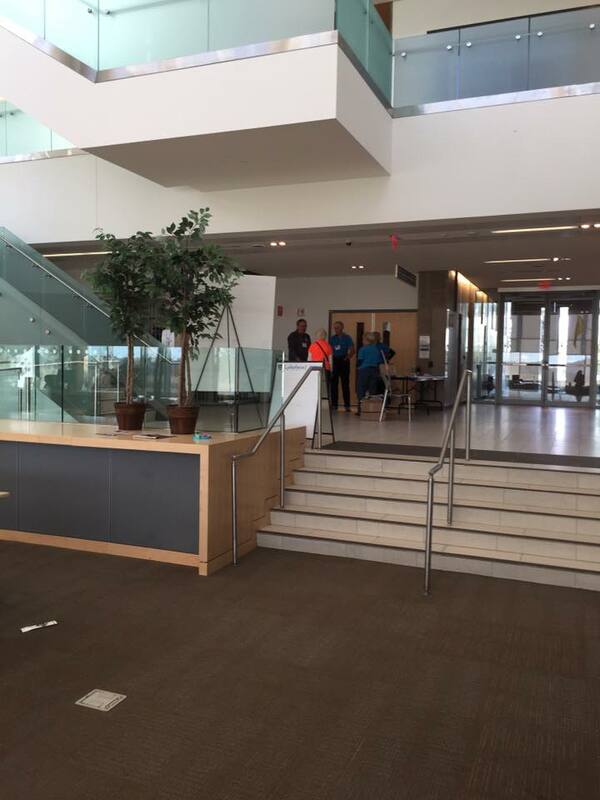 In closing, I would like to thank the staff of Lakehead University, for their assistance in organizing this event. They have been extremely generous and cooperative, and in particular, I wish to thank Dr. Linda Rothenburg, for her guidance throughout the entire planning process. 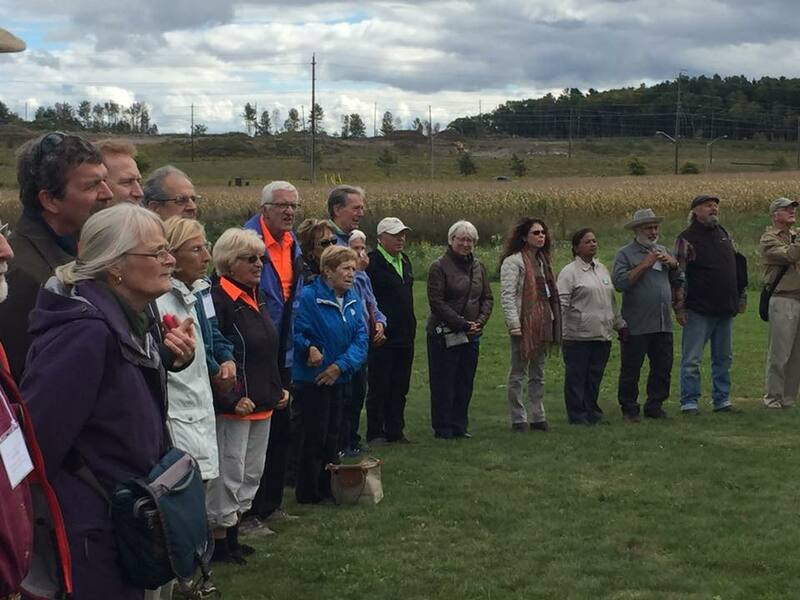 As we are celebrating our 50th anniversary, we recognize and thank the many volunteers who have contributed to the creation and continued existence of the trail itself, but also of the Ganaraska Hiking Trail organization. As such we want to particularly thank the Past Presidents, starting with Jack Goering, who together with Pat Lawson and some others started with the development of the Ganaraska Trail. Jack served 2 terms as president in the late 60’s – and up until 1975. Unfortunately both Jack and Pat passed away last year. Some of you may recall some of the other past presidents: Mac Macklem, Paul Van Vliet, Jim Parsons, Chris Dafferin, and Dorothy Burrus. Unfortunately, we were not able to contact these to this event, some may have deceased. Bob Bowles, president from 2011 to 2016. We also want to thank Bob Wilson, Ron Wallace, and David Royston, who sent their regrets. At this time, we would also like to recognize Peter Verbeek, who was the Ganaraska’s Trail Director for a very long time, and his contributions are immense. He even was club secretary for many years. Peter was a big supporter of end-to-end hikes, motivating many to accomplish the challenge and leading several groups in their end-to-end endeavours. His method of motivation to keep his groups going, was to say we only had a few more kilometres left, but he would never say how many. He bent over backwards to help Linda from the Kawartha Club to hike the Wilderness after a very bad car accident. In particular, he loved the Wilderness section…. In fact, before the trail through the Wilderness was established, Peter tried to plot the route across the wilderness by himself and was at first unable to find a way through. As he was a couple of days late finding his way out, his wife called the OPP who set up a search for him. However, he eventually emerged at Victoria Fails, victorious in establishing the continuous trail through the wilderness. 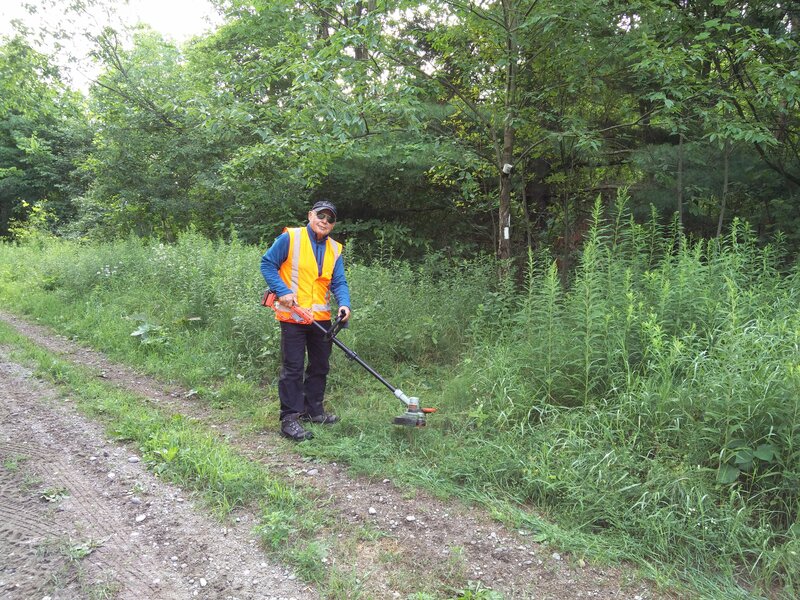 Afterwards, he spent countless hours to maintain the Ganaraska trail. A plaque in his name was erected near Loon Lake in the Wilderness section, one of his most preferred locations. Due to health reasons, unfortunately, Peter could not be with us. Special thanks also go to Marc Vallee, who as a young hiker, in the late 80’s joined the organization and has been the president of the Midland Ganaraska Club for the last 20 years, and as such has been the longest serving club president and board member of the Ganaraska Hiking Trail Association. Kudos to him, for only missing 1 or 2 board meetings in these 20 years, and for being an active participant in our board discussions. 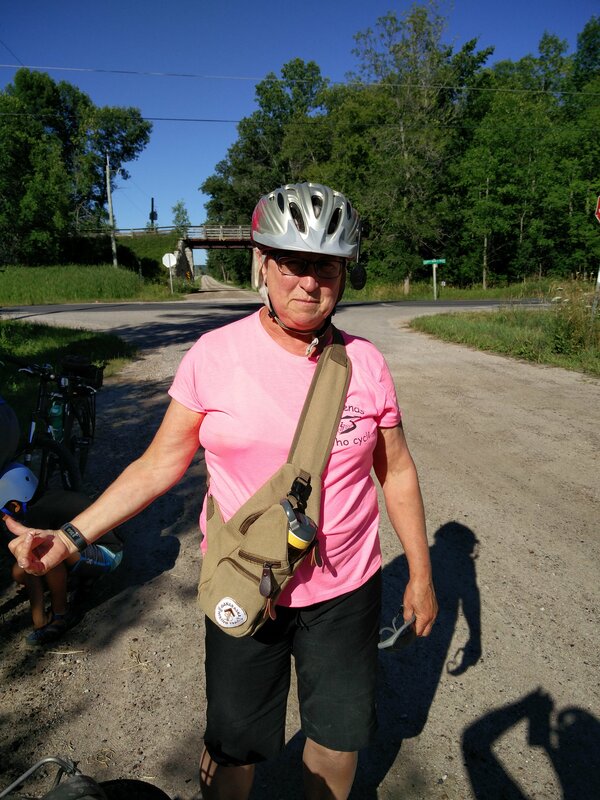 Special thanks also go to Lois Kowal, who has been our membership director for many many years, and is also responsible for welcoming new members, and tracking the End-to-End program. Thank you Lois for your dedication and time. As the President of the Ganaraska Hiking Trail Association, I am extremely pleased with the executive team we put together this year, and I would like to thank Carol Stickland, our secretary and event planner extraordinaire, Stan Muldoon, our Vice President, who chaired all of the planning meetings for today’s event, Simone Latham, our treasurer, and John Sloan, our trail director, for their efforts this year, not only to make this event a success, but also to bring some of our procedures and practices up to date. My thanks also to Barb Rimmer, Irene Bell and Marion Brophy who assisted us on the Anniversary Planning Committee. I also would like to thank Tom Friesen, as of this morning, past president of Hike Ontario, as well as David Rosenblun Bourdieu, Hike Ontario office manager, for their assistance in organizing this summit. Ganaraska End to End in 56 consecutive days: a first! We recently received the attached testimonial of Tyler Gibson’s End to End hike of the Ganaraska Hiking Trail, in 56 consecutive days, this past summer… And we all know how hot it was. As far as we know, this is a first ! We are not aware of anyone else having completed the hike in consecutive days. Very well done, Tyler! Author Frieda BaldwinPosted on October 4, 2018 Categories GHTALeave a comment on Ganaraska End to End in 56 consecutive days: a first! 50th Anniversary Summit… a few photos of a very successful event. 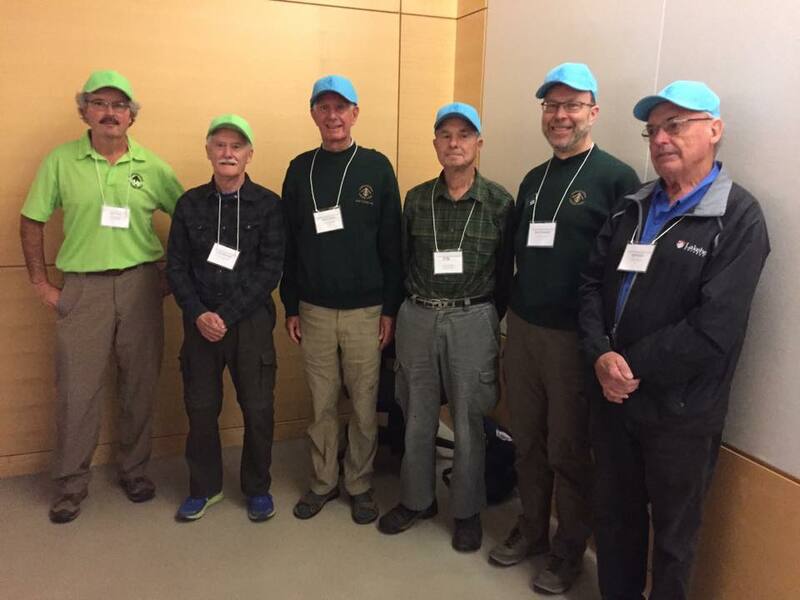 From left to right: Recognition of longest serving club president Marc Vallee of the Midland Club, followed by Past Presidents Paul McCreath, Past President David Francis, Rob Butler standing in for Peter Verbeek, our long term Trail Director, Past President Mike Pidwerbecki and Past President Bob Bowles. Thank you all! Author Frieda BaldwinPosted on October 4, 2018 Categories GHTALeave a comment on 50th Anniversary Summit… a few photos of a very successful event. The GHTA 50th anniversary year winds up with a weekend of hikes, workshops, courses, and celebrations in September. 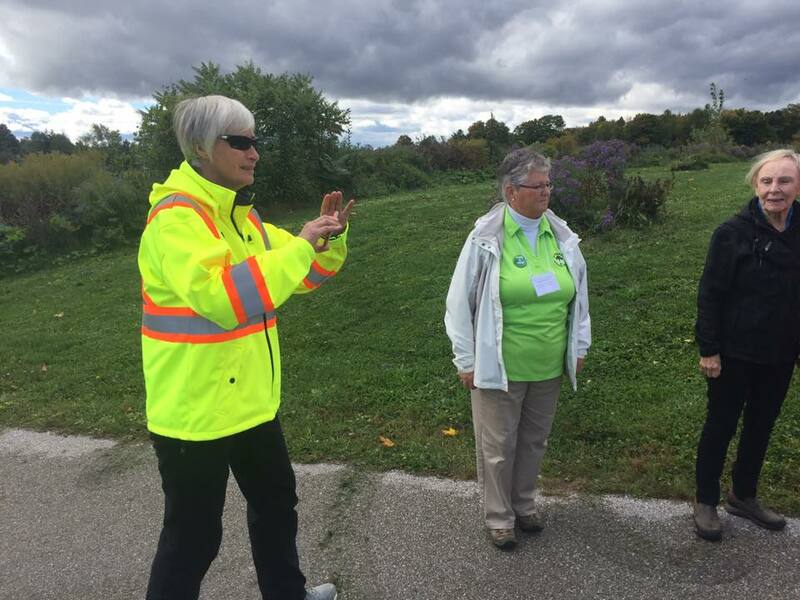 These events are being held in conjunction with the Hike Ontario Summit, an annual gathering of representatives from Hiking Clubs around the province. 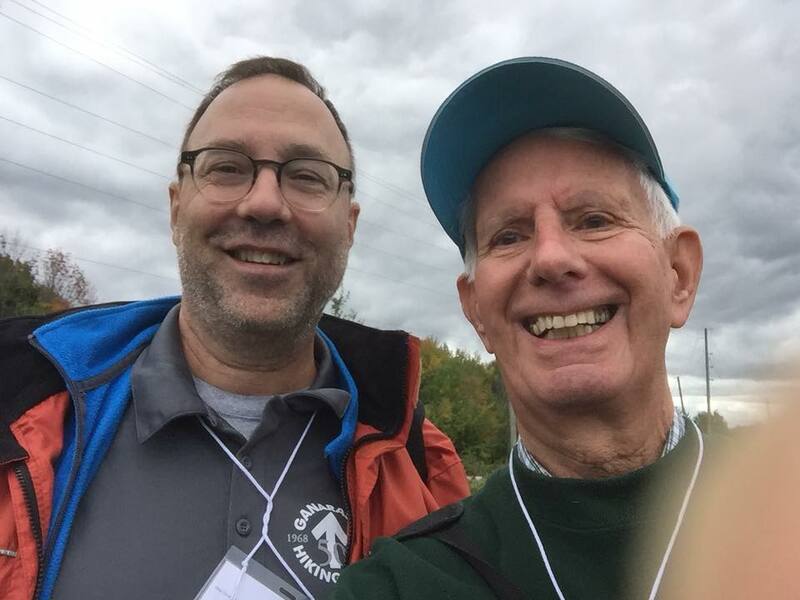 The planning committee is excited to offer this opportunity for GHTA Members to meet other hikers, learn some new skills and celebrate our 50th anniversary together. An outline of the program is provided below. Pre-registration will help us with the planning. (See bottom for registration links) Come for all or part of the weekend. For more information, contact your Club President or any of the GHTA Executive or Board Members. Location: Sam Browne room at Kelsey’s, 405 Memorial Avenue, Orillia. Doors open at 5:30 pm. Order from the a la carte menu; everyone responsible for their own food and drinks. 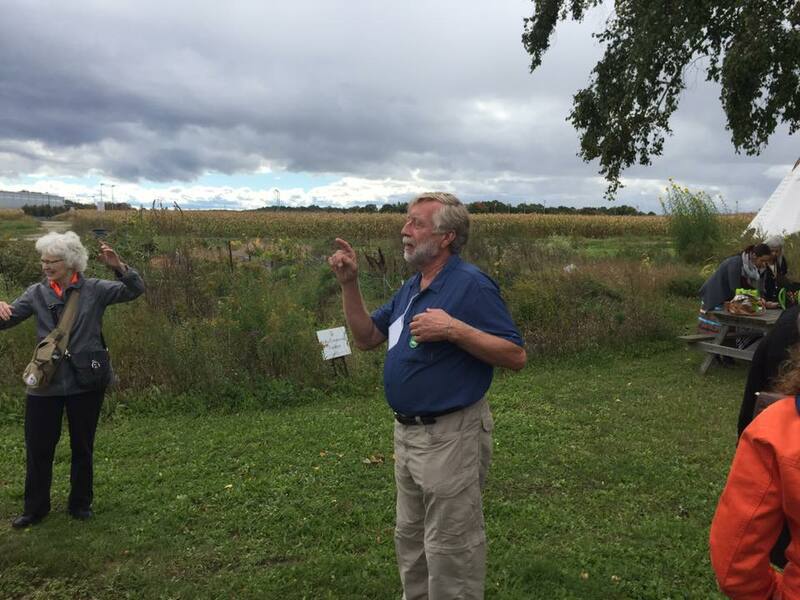 The price of admission is $25 and includes access to the Hike Ontario AGM, Summit and GHTA Celebrations, Workshops & Presentations, morning and afternoon refreshments and a catered lunch. An opportunity for Trail Associations to share their strengths, successes, challenges and questions. A bring and take away session for board members and trail activists. Moderated by Bill Mungall. 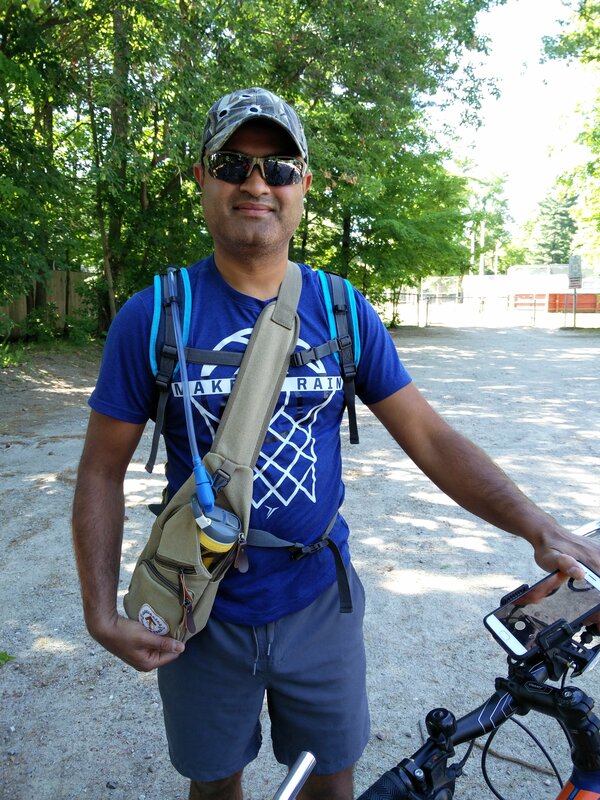 Methods to proactively manage risks for Hike Leaders through training, backpack preparation, hike route selection, advertising the hike, vetting the hikers, choosing routes, etc. Moderated by Tom Friesen. Latest research on Lyme Disease, causes and prevention, detection and treatment. Presented by local naturalist David Hawke, this indoor session will explore the roles that mushrooms, toadstools, slime moulds and other icky things perform within our ecosystem. Please note that this is not a “Can I eat it?” presentation (although poisonous mushrooms will be mentioned). A brief summary of map reading, compass and GPS use for Hike Leaders. Note: this session will go until 4:15 pm. 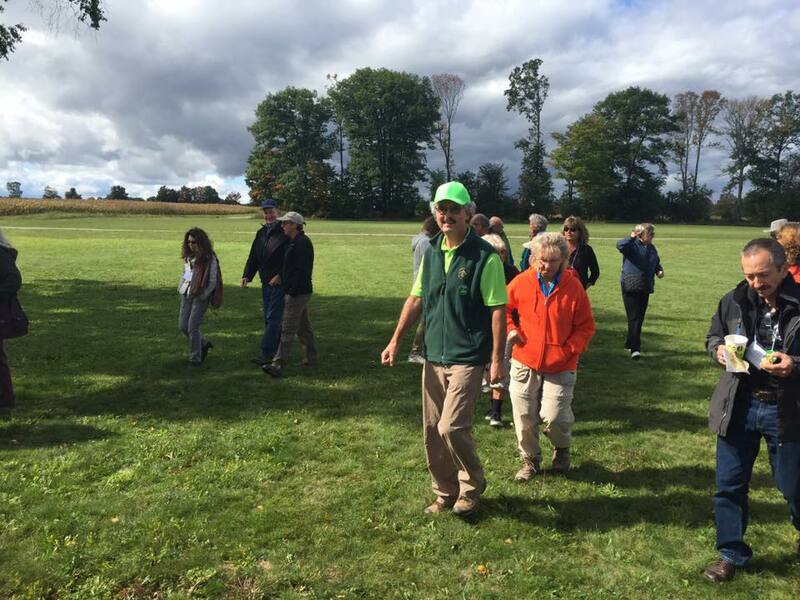 Various hikes at the Copeland Forest, hosted by the Barrie and Oro Medonte Hiking Clubs. Comfort Inn (Orillia) offers nightly room for $145, including a hot buffet breakfast. The Comfort Inn is within easy walking distance of the Sam Browne room and, on the corner of Hwy. 12, easy access to Lakehead University, Orillia. Note: For Ganaraska members, the courses are subsidized. Members pay $25 in the end – but pay $60 up front at the time of registration. They will receive a partial refund cheque in the amount of $35 on the day of the course. For the Certified Hike Leader course, qualifying participants will also be re-imbursed the $25 upon leading 3 hikes for a Ganarska club. Please be advised that the western end of the Tiny section of the Ganaraska Hiking Trail is currently closed from just west of Crossland Road to Archer Road. Archer Road is the northern most street on the Wasaga Beach section. A landowner is no longer allowing us permission to use his property, so we are currently looking (and may have found) a reroute that may open later this year. In the mean time, going east from Archer Road on the Tiny section of the Ganaraska is impossible. So your best option is to pick up the trail again from about 1 km west of Crossland Road on the Tiny Townline. You will see that the road dead ends at a farm. A forest track continues, but that leads to the closed section. Park near the farm on the side of the road and hike east towards the Tiny Marsh along the Townline until further notice. At this time of the year, weeds may grow tall on the Ganaraska Hiking Trail. 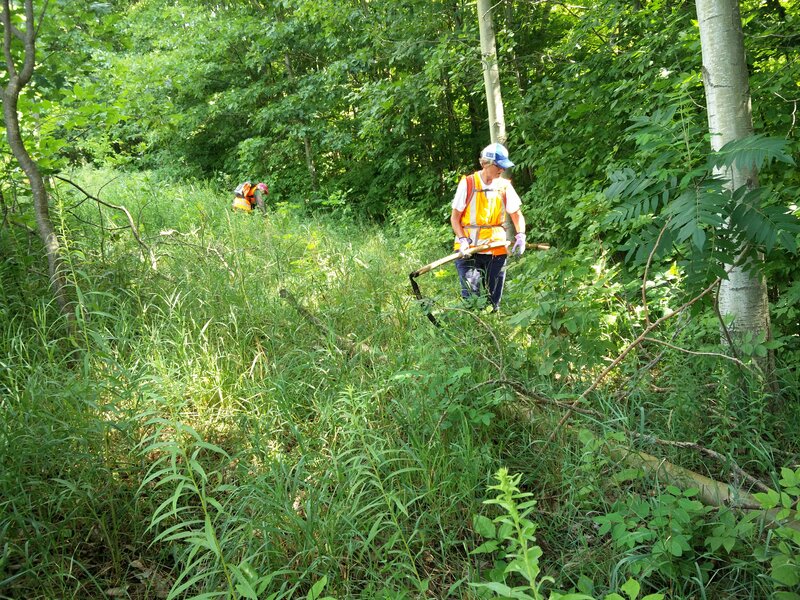 It is difficult to keep up with the maintenance, but today, we gave it our best, and cut weeds on a section of the Midland Ganaraska Hiking Trail. We attacked the weeds with whipper snippers, but really love working with scythes. This old-fashioned “jack the ripper” tool is light, and ergonomically designed. As such, volunteers can work with it for hours, without tiring. We also trimmed branches that were obscuring the blazes. Trail users should be reminded that the maintenance standards of the Ganaraska Hiking Trail are considered “minimal impact” to the environment, which means that we just clear enough to make the path and the blazes visible. And that is even a daunting task, but here are some pics of today’s effort, that show one of the teams at work and at rest. 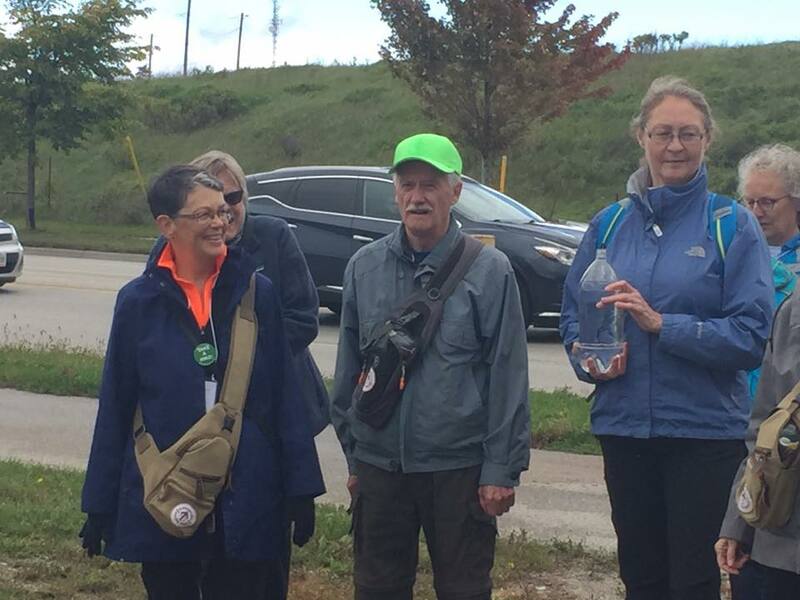 A few days ago, members of the Midland Hiking Club of the Ganaraska Hiking Trail carried the ceremonial water bottle, with water from Georgian Bay, over part of the Tiny section of the Ganaraska Trail. 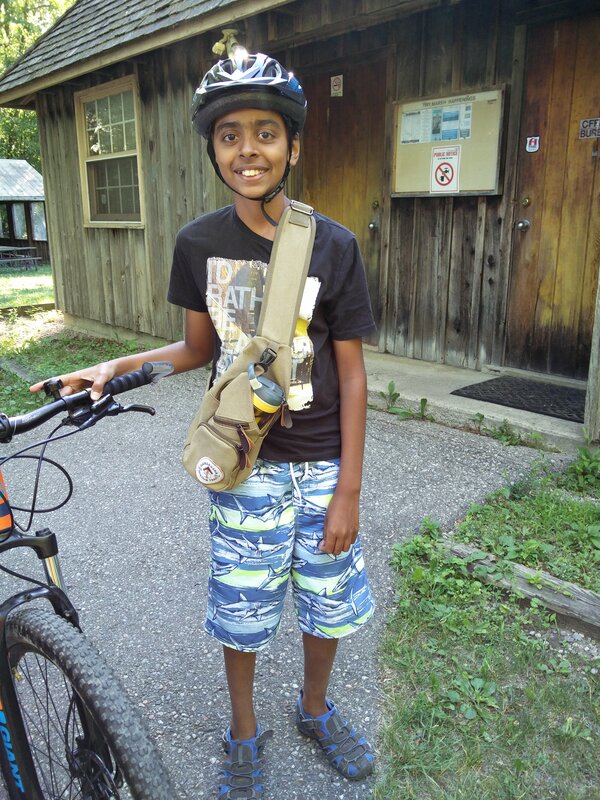 They rode their bike along the Tiny Trail, and through the Tiny Marsh. Other than a flat tire… it was a great ride. 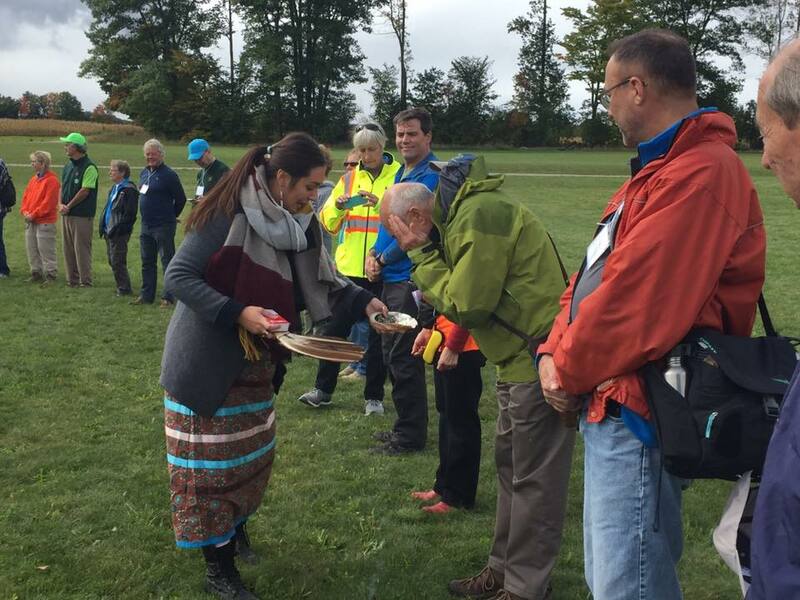 On August 2, 5 and 11, the water relay continues along the Midland section of the Ganaraska Trail, before it is handed over to the Oro-Medonte club. 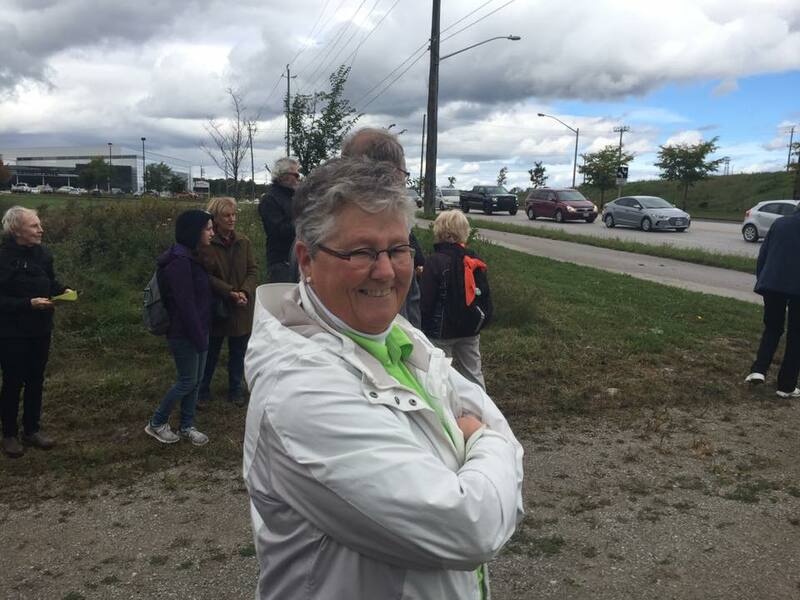 The water bottle, as well as one coming from Port Hope, with water from Lake Ontario, is expected to arrive in Orillia, at the Lakehead University Campus for the Ganaraska’s 50th Anniversary Celebrations. Adi the water carrier Jaz the water carrier (and flat tire repairer) Water carrier Linda (who also helped source the sashes for the water bottles) Water carriers from the Midland Hiking Club Association president Frieda, also a water carrier. 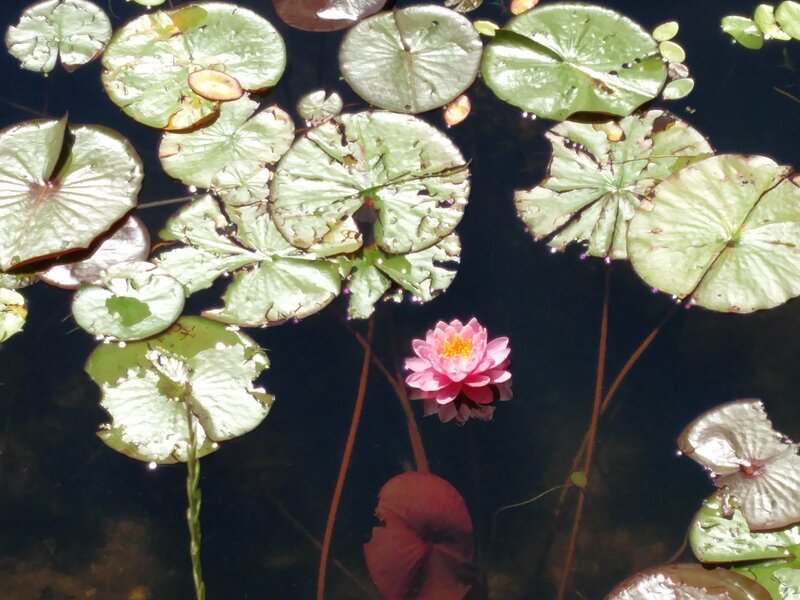 Waterlilies, both white and pink, are in full bloom. 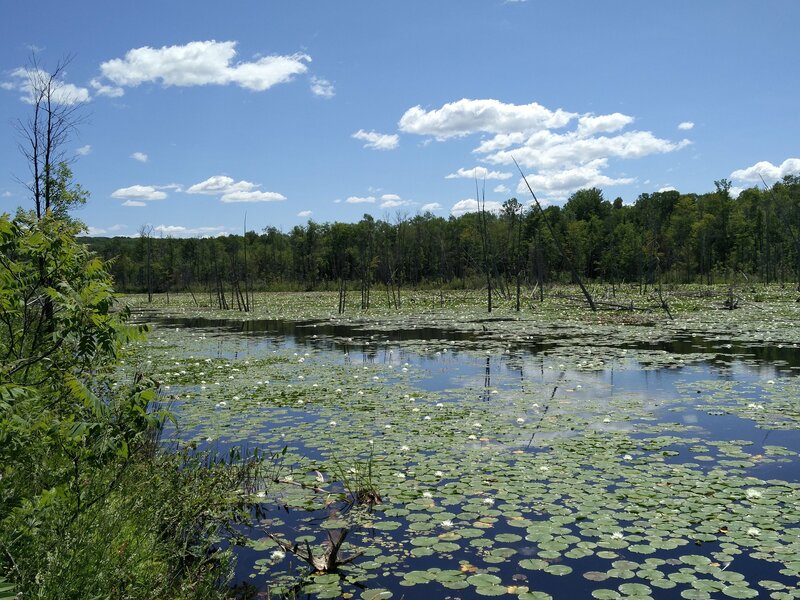 Today, Midland Ganaraska Hiking Club members enjoyed their beauty while hiking along the wetland off Rosemount Road, in Waubaushene, Ontario. Last fall, we had reports that the Mad River section of the Ganaraska Trail, between Utopia and the westerly cairn of the Ganaraska Trail in Glen Huron, was in dire need of some TLC. Since the Mad River club did not have the capacity of doing the maintenance on this 50 km section of Ganaraska Trail, adjacent clubs came to the rescue, and thanks to the excellent weather in the late fall, and with the help of many volunteers, we managed to bring the trail back into shape… for the most part. In total, we organized 6 trail maintenance days between the end of October and mid November and reblazed 38 kms. 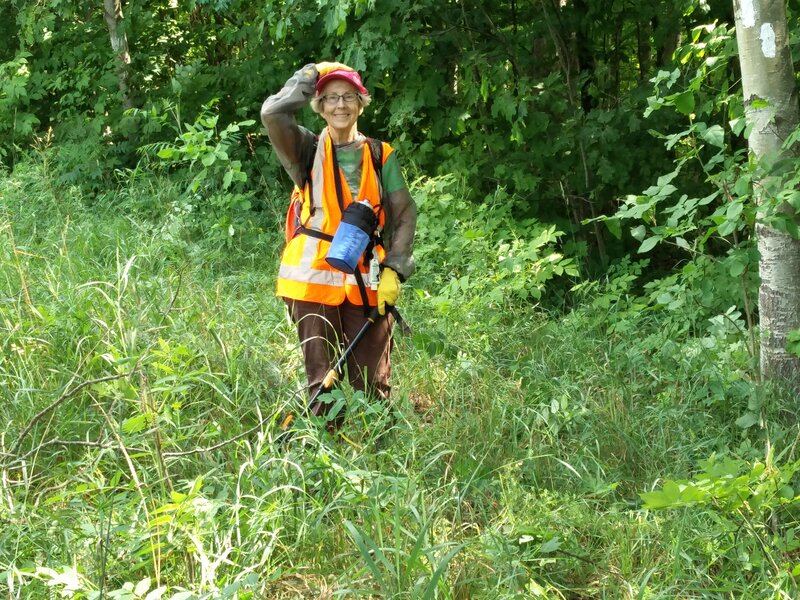 We had to deal with wind storm damage, a myriad of new trails in the Brentwood Forest after a controlled forest fire, new fencing at the Glencairn Conservation Area, hydro poles that had been replaced, and we cleaned up around the cairn, etc. Twenty five volunteers from the Midland, Wasaga Beach, Mad River and Barrie clubs, as well as Ganaraska President, Bob Bowles, contributed a total of 36 volunteer days to bring the trail from km 11.9 in New Lowell to the cairn in Glen Huron, where the Ganaraska meets the Bruce Trail, back into shape. Many thanks to all volunteers! Unfortunately, we have not found a solution yet for the section from km 0 in Utopia (end of Barrie section) to New Lowell. This section currently follows the now fully abandoned and badly overgrown Barrie-Collingwood railway line. We may need to organize a re-route for this section. In the interim, this section of the Ganaraska Trail remains closed.